Aaron Copland Collection - The Library of Congress celebrates the centennial of the birth of the American composer Aaron Copland (1900-1990). Spans the years 1910 to 1990 and includes 400,000 items. Manuscript and printed music, personal and business correspondence, diaries, writings, scrapbooks, programs, newspaper and magazine clippings, photographs, awards, books, sound recordings, and motion pictures. All About Beethoven - Information regarding the life and music of the great composer. American Brahms Society - Disseminates research on the life, music, and historical position of Brahms. Amy Rigby - Official site. British Composers Project - Index of over 50 British composers. Charles Ives Society - Biography, bibliography, works, and descriptive catalogue. 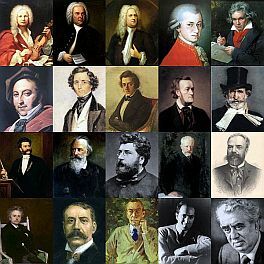 Classical Composers Database - Over 2,300 entries. Classical Music Navigator - Information on important classical composers and their works. Composer Resources Index - Provided by MusicWeb International. Cy Walter - Official Cy Walter web site created and maintained by Cy's family. Although sometimes categorized as a "jazz improvisationalist", Cy preferred to characterize himself as a "stylist of show tunes". Cy's musical compositions were often the subject of collaboration with talented lyricists, including Herman Ackman, Edmund Anderson, Jimmy Dobson, Richard Kollmar, Alice Michel, Maurice Rose, Andrew Rosenthal, Chilton Ryan, and Alec Wilder. Composers Bureau Online - Resource of information about contemporary American composers. Edward Elgar - A comprehensive guide to the man, his music, and the organisations that support him. Also see Wikipedia and UK National Archives. Dr. Estrella's Incredibly Abridged Dictionary of Composers - Basic and accurate biographical information on hundreds of composers. Links to additional information at other web sites, to sheet music, and to CDs and books about the composers. Hoagy Carmichael Collection, The - Every item in Indiana University's extensive collections pertaining to the life and career of master songwriter Hoagland "Hoagy" Carmichael (1899-1981). Josephine Baker - American expatriate entertainer and actress. She became a French citizen in 1937. Most noted as a singer, Baker also was a celebrated dancer in her early career. She was given the nicknames the "Bronze Venus" or the "Black Pearl", as well as the "Creole Goddess" in anglophone nations. In France, she has always been known as "La Baker". Judy Garland Database - A long-term project dedicated to documenting Judy Garland's career, with emphasis on the MGM years (1935-1950). It is an attempt to pull together all the bits and pieces scattered throughout the many books, documentaries, liner notes and magazine articles about Judy; to pool all that information into one reference volume in a convenient format in which the serious student can find the facts pertaining to Judy's work. Also see the JGDB Master Song Index. Kronos Quartet - Presents and promotes contemporary music and expands the repertoire for string quartet. Kronos commissions about a dozen new works each season and performs more than 100 concerts a year, touring for 22 weeks to an average of 15 countries and 15 domestic states annually. Melissa Crabtree - Road-wise folkie with a bluesy soul. Mozart Museum [Mozarteum Foundation Salzburg] - A non-profit organization whose primary focus has been the life and oeuvre of Wolfgang Amade Mozart. The organisation offers concerts, maintains the Mozart museums and supports academic research. Musician Biographies - Musician personals, awards, and works. Robert Ashley - American composer, best known for his operas and other theatrical works, many of which incorporate electronics and extended techniques. Also see Wikipedia entry. Stephen Kent - Multi-instrumentalist and composer, master didjeridu, and radio DJ. usopera.com - At the heart of the site are detailed pages on individual American opera composers and their operas. There is also a complete list of recordings, books, and scores for the entire site, a timeline of some important events in American opera history, and some scores of American opera music for free download. Wagner FAQs (Richard Wagner) - The list of frequently asked questions (and their answers) for the news- group humanities.music.composers.wagner. Women Composers - Only composers of classical music whose works have been released on compact disc, have been included in this database. Composers are listed in alphabetical order, and their name is followed by their date and country of birth (which may in some cases differ from their country of residence). Yip Harburg - Legendary lyricist and human rights activist. This webpage last updated on Sunday, November 12, 2017 12:09 PM.